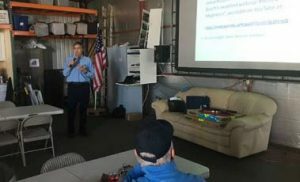 For our Saturday, January 12, BBQ Lunch and a Program, chapter member Dan Masys presented an interesting program about aircraft engine ignition systems that covered both magnetos and the more modern electronic ignition. In the hour-long presentation he reviewed the early history of aircraft magnetos dating to the earliest days of aviation and also the technical aspects of how magnetos work. He then reviewed the nuts and bolts of electronic ignition systems and the advantages the newer technology has over the tried-andtrue magnetos. He also provided some personal experiences he had converting his six-cylinder engine to replace one magneto with electronic ignition. Very interesting stuff to pilots that provided a bit of useful technical detail.